A house becomes a home with special details and finishing touches. One of the hardest things for consumers to do is choose a good home builder or re-modeler. You would think that in this market, consumers would have their pick of the litter, so to speak, and for the most part, they do. Still, it’s always good to get a recommendation and this may well be the best: the winners of the 2011 HBA of Greater Dallas ARC Awards — that’s HBA as in Home Builder’s Association, and ARC as in associates, re-modelers and home builders. Last Saturday the HBA feted and honored this years’ winners with a gala event at The Westin Galleria. The ARC Awards honor excellence in the building industry as judged by their peers, kind of like an Academy Awards for the local industry. 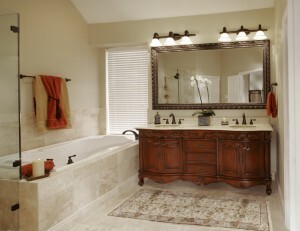 USI Design & Remodeling was honored as a recipient for the Master bath remodel of the Coplin project. A few oustanding features of the bathroom include; timeless European design, elegant intricately detailed furniture vanity and classic stone work. USI is proud to play a part in the Greater Dallas HBA family and to support safe, affordable, quality construction in Texas.